Toyota cleaned up in that survey. The 2018 Yaris is reliable because nobody will ever want to be seen in it and it will just set in the driveway waiting for that big day when it gets moved over for another car to park in its spot. The front end is hideous. 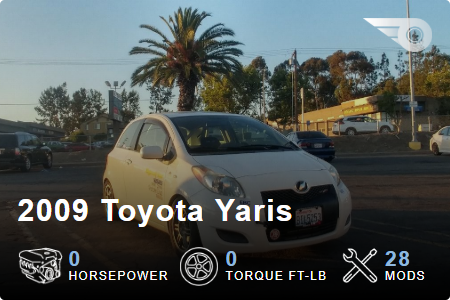 the Yaris is on the list because literally its using parts thats been known to work for years and years and years, the engine has been around since the 90s, the trans from near 80s, and the parts on it are all.. basic. so it makes sense. Sadly, all current Toyotas are rather hideous looking. But, it doesn't change the fact that a Toyota is the most reliable vehicle in the long run... and the Yaris is basically bulletproof. I don’t trust JD Powers. You think they are trustworthy? Is that Yaris the Ia, The one made by Mazda? I still think a black SE hatch looks great with the 2018+ styling. Great blending color. The Yaris is ultra-reliable because it plays it very safe (& cost-cutting) with venerable, time-tested Toyota tech for the most part. Exactly what U.S. reviewers bash it for, is why I love it. ^^^ Although I'm not a big fan of black cars anymore (every car had to be black when I was younger), I agree with you. I would go as far to say that many current Toyota models would definitely be best in black. I can attest to KIA's reliability. Touch wood. But our KIA sportage is lapping the miles with no problems. You are one of many Hyundai/Kia owners who swear by their reliability. "Touch wood." Unfortunately, there are hundreds upon hundreds of documented cases of never-ending problems... and terrible customer service. It's reliable hence why it made the list up there. All KIA needs is a cult car. Something like a proper hot hatch. Kia has a cult car... the wicked ugly and highly rated Kia Soul. I liked the first gen Soul. The current iteration doesn't do it for me. Haters gonna hate. The proof is in the pudding. Kia is putting in the work and is starting to show. Last edited by junorico24; 09-07-2018 at 02:45 AM.